At Growing Earth Tree Care, we consider ourselves to be something of a renaissance tree care company, with services that range from tree pruning, pest control, tree trimming, soil and root care, all the way to emergency tree removal. If you live in Northern Virginia and are in need of a tree care company that knows the region and the community, look no further than Growing Earth Tree Care. We are proud to be a part of communities that include Loudoun, McLean, Reston, Springfield, Vienna, Falls Church, Fairfax, Great Falls, Ashburn, Alexandria, and Arlington, to name a few. But if you don’t see your town’s name written, give us a shout to see if you are within our service area. It’s a safe bet we will be able to come out and give you the expert tree care service we are known for! Today’s post is about tree and stump removal. We are going to try to convince you to use our expertise and services the next time you want to remove a tree or stump from your yard or commercial property. The thing is, not everyone knows when it is appropriate to start fresh and get rid of the old. It’s our aim to educate our readers about how to determine if the time is right to cut down the tree in question. At Growing Earth Tree Care, we know how to analyze a situation to determine if the amount of risk a dead or dying tree poses, in addition to knowing both when and how to remove a superfluous tree from any given environment. Allow us to educate you in the short-term, with the prospect of you remembering us as your tree removal company, should the need ever arise in the future. Seems like a fair trade to us! Now let’s get started. Maybe you are a busy person, maybe you are a touch indifferent to tree care, or perhaps you have some goth-tendencies and are into the aesthetic appeal of dead and dying trees around your home. We respect all three positions, especially the latter, but it doesn’t change the fact that dead trees need to be removed before they become a problem. What kind of problem? Excellent question. Sometimes trees get in the way of a new structure or environment, like a new addition to your home. These trees might not even be dead, but are just an obstacle to be removed in the name of progress. But another reason is overgrowth; if trees get too big for their birches (sorry) and overshadow a house or different structure, it can pose a significant safety risk which needs to be nipped in the bud. It is a sad part of life, but all living things must die, and trees are no exception to that rule. The most common reason that we see people ask for emergency tree removal is that the trees have lost strength and viability because of a disease, pests, or it was simply their time to go (old age). With the passing of one generation comes the dawning of life for a new one. Clearing your tree and stump out can lead to new opportunities for landscaping. 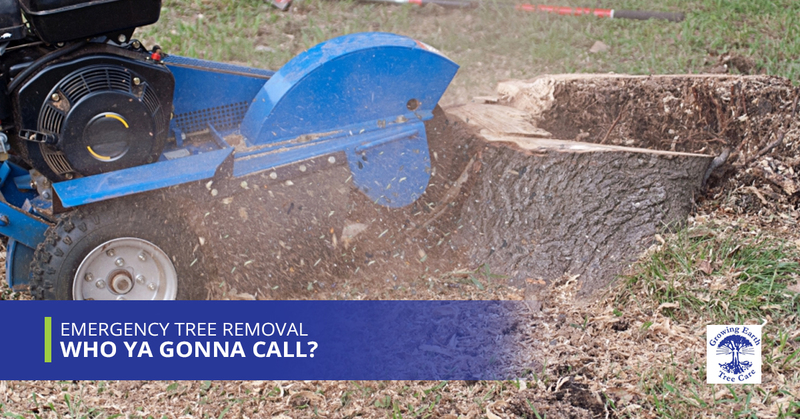 We strongly recommend you consider calling a tree removal company before you do anything to remove the tree in question. Even for our certified arborists, some trees may have decayed to the point where they are no longer safe to climb. But we’ve been a part of our fair share of tree removal projects in our time, so we know how to employ measures that will get the job done while keeping everyone safe. If you are on the fence about getting that tree or stump removed, or if your tree has fallen on your fence, at least give us a call to get a free estimate out of the situation so you can get a feel for the bigger picture. But speaking of the bigger picture, remember that the immediate cost of emergency tree removal will pale in comparison to the safety of your family and structural integrity of your home. We hope that is sufficiently convincing! Call Growing Earth Tree Care today.